Last October, I wrote a post showing that in the market’s rise, 70% of the top 10 stocks in the IBD 100 list outperformed comparable stock indexes. Well, I repeated the analysis for the top ten stocks in the IBD 100 list published on 01/11/2010. I compared the closing price of each stock on the Friday before Monday’s list was published to the closing price yesterday, on 02/09/2010. I am a big fan in buying IBD 100 stocks in a market up-trend, but was still very surprised by these dramatic results. (Click on table to enlarge.) During the time when the index ETF’s SPY, DIA and QQQQ all declined from -6.4%, -5.2% and -7.4%, respectively, 90% of the IBD100 top ten stocks declined from -13.6% to -43.3%. During this same time period,the Ultra 3X bullish technology ETF declined only -24.2%. In fact, while 58% of the NASDAQ 100 stocks declined -6.4% or more, only 4% of them declined -20% or more, compared with 60% of the IBD 100 top ten stocks! 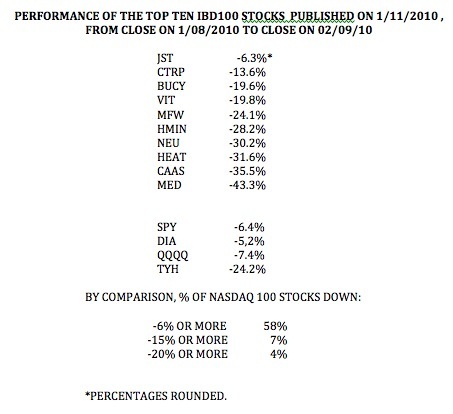 Clearly, the IBD 100 top ten stocks were trounced during the recent market decline. I really should not be surprised by these results. The IBD 100 top ten stocks are among those growth stocks that have advanced the most in the up market. Therefore, when the market turned down, it makes sense that these stocks would decline the most, as many traders take profits. The key message of this analysis is that while the IBD 100 stocks might be great stocks to ride on the way up, I must exit them quickly when the market trend turns down. Hence the critical importance of the “M” in CAN SLIM. Have watched your site for many years, and commented time to time. I noticed a while back that buying IBD top 10 was not wise. You are right in that they generally have been rising for a good while, and getting to the top 10 seems to be a signal to (I assume) many professional traders, if may be time to temporarily vacate.. I tend to like to watch stocks entering top 50-60, who continue to move up..